I haven’t done a “soap box” post in awhile but I was at a (traditional) quilt guild meeting yesterday which sparked a bit of discussion about modern quilting. One of the members brought in an antique machine quilted quilt that I just fell in love with. Antique Quilt – Look at all that negative space! She purchased it a long long time ago and said it was made and quilted by machine in the 30’s. Can you believe it? Just like we like to shun the quilt police nowadays, back then, this quiltmaker did her own thing and broke convention by finishing it on her machine. 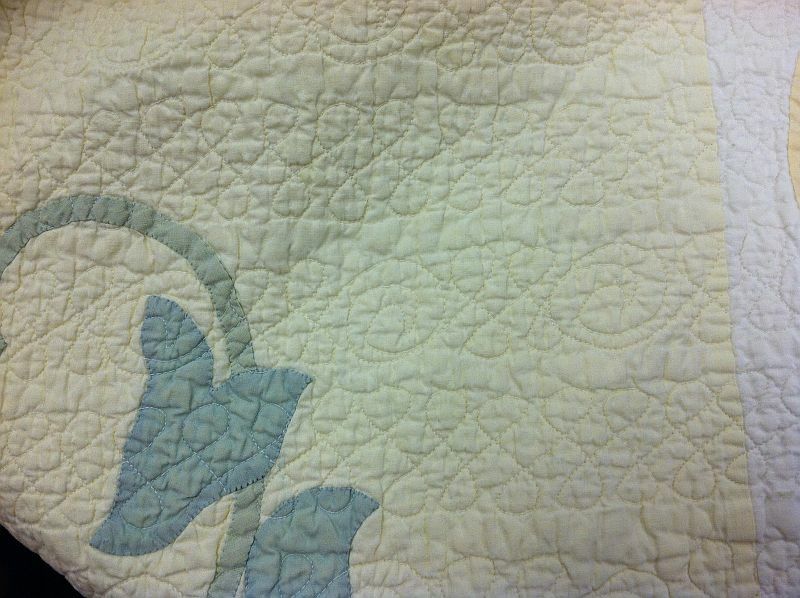 The most interesting thing to me about this quilt is that it had some quilt designs that we would now define as modern. Look closely and you can see some loops and a few swirls. The quilter probably did not have a lot of space to work with and even though it’s a little hard to tell from the photos, she quilted it in rows. There is a gap in between each row of quilting which I think adds to the charm. 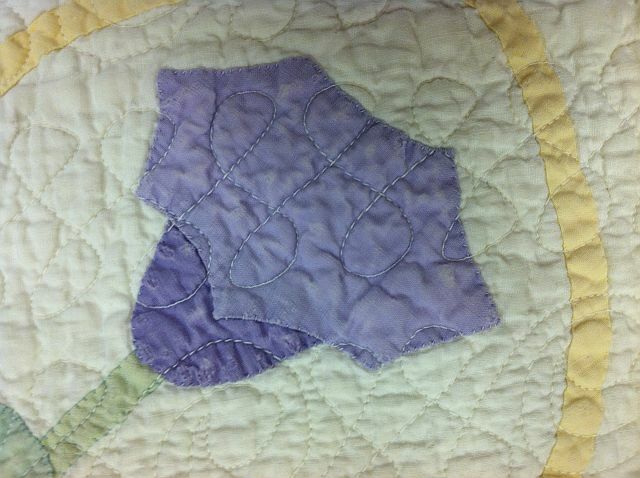 Another of our members said she just didn’t quite understand modern quilting and I told her, just like this antique quilt, much of modern quilting is rooted in tradition. The best definition I’ve heard was from Heather Grant when she spoke at QuiltCon earlier this year. She said, “Modern Quilts are to Art Quilts like Graphic Art is to Fine Art.” Very evocative and descriptive! 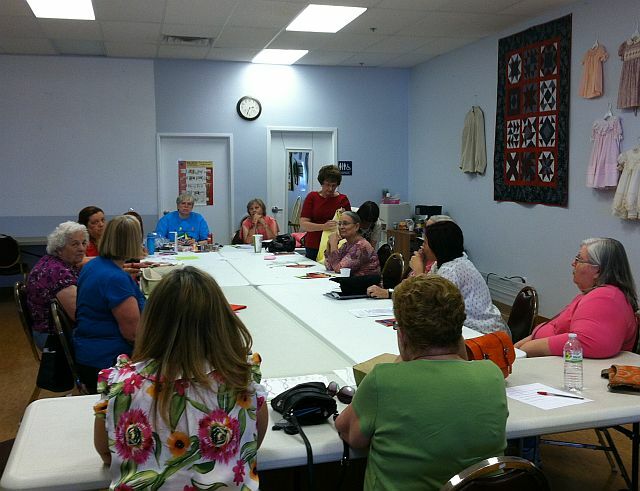 Traditional Quilt Guild Meeting – Look at that quilt on the wall, it’s “almost” modern! I’ve posted that some modern quilters act like its all new – because they do! However – just like all generalizations – it’s not really applicable to an individual. I think what started out with a very strict (and narrow) definition has now turned into people making quilts using a certain style of fabric. It’s odd to me – as if people who primarily used batiks defined themselves as different quilters. However, I understand the benefit of congregating with people who appreciate your design aesthetic. I recently submitted a modern quilt to our county fair – it was the only one. And the only quilt in the “original design” category. So it won 2nd place for the category. I love the modern aesthetic and I’d go to a MQG if there was one nearby – but I cringe when I hear someone say modern quilting is doing something new by using solids, asymmetry, original design, or getting away from traditional block format. Congrats on your ribbon – that’s fantastic! Christa, I forgot to ask: The quilt you pictured from the Traditional Guild Meeting: Can you design a modern version …your idea of what the quilter was thinking….? I was drawn to quilting for a number of reasons and I don’t think being modern, traditional, feminist, conservative or liberal was one of them. At first, I wanted to sew and work with fabric like my Dad and my Grandma, but I could not make clothes that fit me or anyone else. The straight lines in a rail fence and a nine patch were about as good as I could get…lol. Now some ??? years later with all the “modern” tools and tips I have managed to complete over 200 baby quilts for the local hospital ( two yrs ago..on a dare!) using a star and heart design. 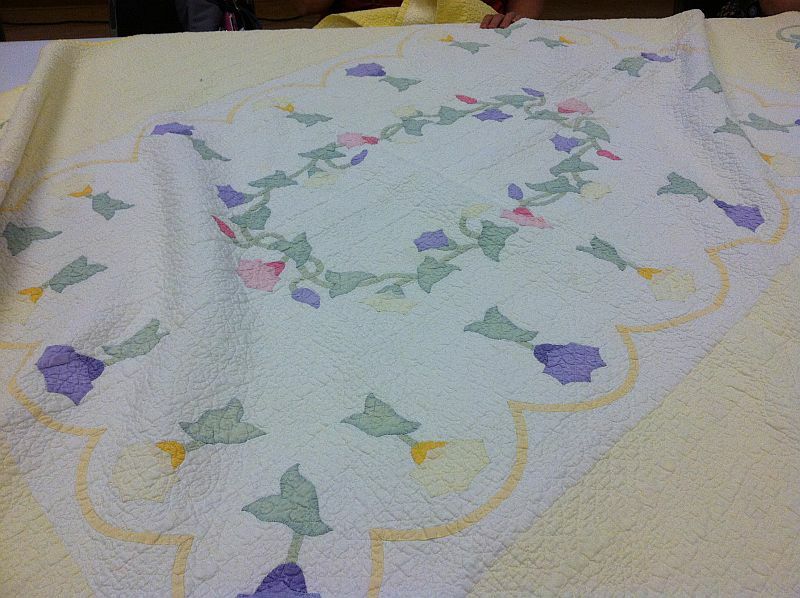 And two full size bed quilts… my 1st queen/king is being quilted now.. I can’t say I am modern or traditional because I love the total “Art of Quilting” because of the history from those before us and for the history we are leaving behind. I would love to go back in time to visit with a quilter to learn what her inspiration was and yet I am totally overjoyed that I have to modern convenience of a rotary cutter and a wonderful new sewing machine. The simple things may be modern but oh well, I am still making history. I can certainly agree with all the comments above. Sometimes I’m a traditionalist (but not often..haha) but most of the time I’m drawn to modern quilts. I’ve always been a “rebel” inside myself but outwardly I’m conservative. I enjoy letting that “rebel” out and expressing myself through my quilts. I belonged to a traditional quilt guild but they were not open to modern quilting so I dropped out. I’d love to be in a group that wasn’t afraid to try new things. I never see any blogs or comments about getting negative feedback on the modern quilts that you’ve made and how that made you feel and what did you do to handle that negativity. Has anyone experienced this?? I think in the end it is all just quilting. I’ve never heard of knitters or clothes makers being defined as traditional or modern so why do it with quilting? It is all just personal preference for fabric and designs. What a great post title – sums it up nicely! That quilt is fabulous and love the quilting! The gal who brought it in said she has more to share next time. I can’t wait to see! To me it is open to such a huge range of differences, depending on the design and the fabrics used. Am I a modern quilter? Sometimes and other times I am much more traditional. It all depends on who I am making the quilt for. I tailor it to their tastes instead of my own. I have no idea if I class as traditional or modern, and I do not care. I sew for pleasure, I sew for the love of handling different fabrics and turning them into a gift of something unique..Sometimes I follow a pattern, sometimes I improvise to use up every last scrap. I use negative space to highlight a treasured print. I am fairly new to quilting and making it up as I go or following a pattern give me equal joy..
Well said. Sometimes we tend to over-categorize ourselves! I think the difference between modern and traditional quilting is a thin one, mostly based on fabric selections, personal preference, etc. I liken myself with modern quilters, but I’m currently working on a bear claw quilt – a traditional block if there ever was one. I think as modern quilters, we do need to look at traditional quilting history. That way, we can interpret these things in our own way.